Last weekend I was invited to attend a Thermomix demonstration. Who could say no when they offer to cook you lunch? And lunch was good – it started with strawberry sorbet, obviously to cleanse the palate (so to speak) and then we had a herbed dip, a beetroot salad, a vegetable soup and chicken veloute with freshly made bread rolls and to finish an amazing custard. All cooked in about 2 hours. What impressed me most with the demonstration is that the machine can replace several gadgets as well as being a big timesaver in the kitchen and can help you saving money by using fresh unprocessed food wherever possible. It was also very simple to clean. 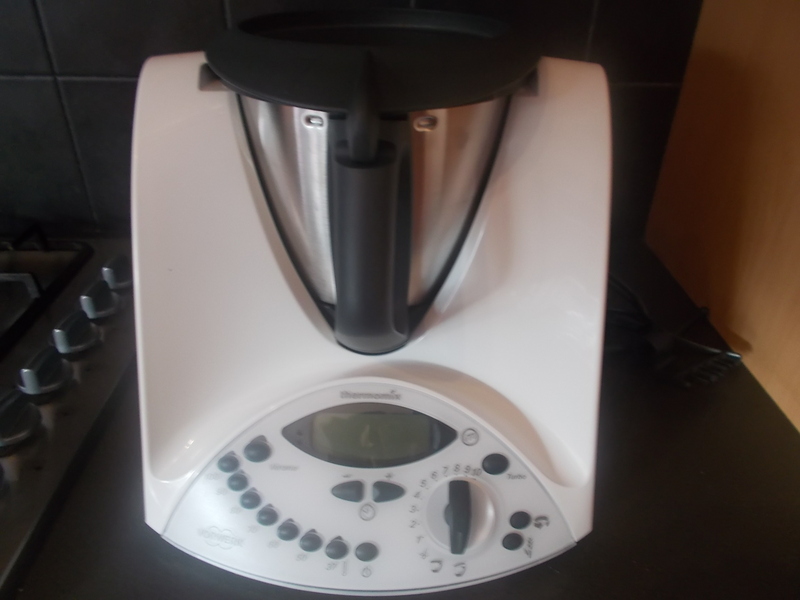 For those of you unfamiliar with a Thermomix you can actually grind your own flours with it, use it as a juicer, make sorbets and icecream as well as easily chopping up vegetables. It also cooks at several different temperatures and can even stir ingredients on a couple of different settings to allow you to make a stew, stir fry or a risotto. If you want more information have a look at their website or hop on to the youtube channel and actually see it in action. The benefit that really appealed to me as someone who spends a lot of time cooking from scratch is the speed with which you can produce a healthy meal. Now finally someone is focussing on some better options for time poor people in a busy world. Even more so when you are catering for children with allergies and intolerances where the food becomes more expensive. A gluten free loaf of bread for example is often around $7, even just making your own gluten free flours as you need them could be a great cost saving. If you decide to follow up on a Thermomix there are lots of people around who sell them through party plan so just do it quietly or risk being inundated with offers!! How do I save time in the kitchen? One way is to prepare batches of meals and freeze them – I particularly like the site Once a Month Freezer Meals as I think its a great resource and they even have gluten free and dairy free meal plans. My best timesaver however was teaching my husband to cook a few simple meals – although the children got annoyed when he added chilli to my gluten and dairy free lasagne but it tasted great!! And my proudest moment was when I came home and found him teaching my daughter to make the lasagne. The best timesaver of all – sharing the load. Christine Pope is a homeopath and nutritionist who practices at Elemental Health, St Ives. She can be contacted for appointments on 8084 0081. I have also been to a demo and was very impressed – and very tempted. My only thought was the lack of human contact and love going into the food. There is some other dimension to food that has been ground, stirred, kneaded by hand with good intention. I agree with the intention however I think being able to feed your family fresh unprocessed foods and still have time to drive them to activities is also worthwhile. Sydney parents are just so busy these days.